The Daylight Savings Bill passes in Congress, to go into effect on March 27. Missoula, Montana will be 96 minutes "behind the sun." The University of Wisconsin president argues that Germany can not be starved and must be beaten by superior efffort and coordination. The weather column in the Missoula newspaper leads with "Reduce consumption of beef this spring." General Murray leading the Army Department of the West has dispatched troops to suppress the IWW riot in St Maries, Idaho. 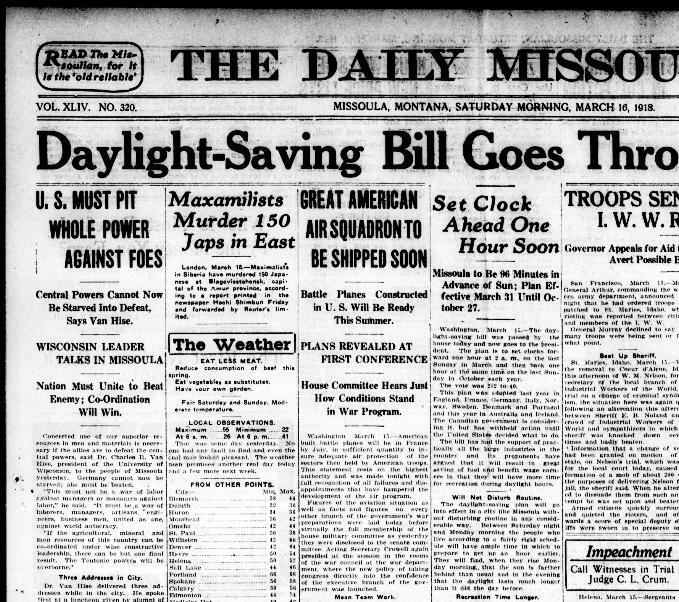 Source: "Daylight Savings Bill goes Through Congress," The Daily Missoulan, Missoula, Montana, March 16, 1918. Page 1, Column 4.